Saraswati Puja Archives - Khaled Rent A Car in Dhaka, Bangladesh. Your Secured and Trusted car rental partner. In phase with the moon, at a certain time on a certain day in the Bengali month of Magh, Saraswati Puja begins at Dhakeshwari Temple. Downtown in a market district crowded with shops for rickshaw repair a narrow street leads to the gate. Beyond the gate, a wide plaza spreads, paved and scored into squares. At the rear, four identical temples to Shiva form a line, each sheltering a Linga. To the left there is a tank, a manmade pond; to the right stands the main temple. The Brahmin, Pradip Kumar Chakraharti, told me the temple was built about 1800, but this was a place of worship long before Dhaka, then the Mughal capital of Bengal, expanded in this direction during the seventeenth century. By a great tree, in front of Shiva’s houses, between the tank and the temple, a rented pavilion has been erected for the puja. The masonry buildings are painted a tawny yellow with red trim. The pavilion splashes the plaza with color, pink and blue and scarlet. At the end of the long, canopied tunnel, the statue of Saraswati is raised upon a stage. The goddess has descended, enticed into the clay by prayers and the beauty of the image prepared to receive her. She has been garlanded as a revered guest should be flowers and green plants surround her. Baskets and bowls of food are spread before her. Water, the source of life, must be present, and it is—in the tank beyond and in the painted kalshis set below the stage. One rail isolates an area at the front where the Brahmin and his assistants, young men in crisp white shirts and dark pressed slacks, control the flow of events. Another rail separates the women and men who press forward in a warm crush to see, to take darshan, connecting, eye to eye, with the deity. 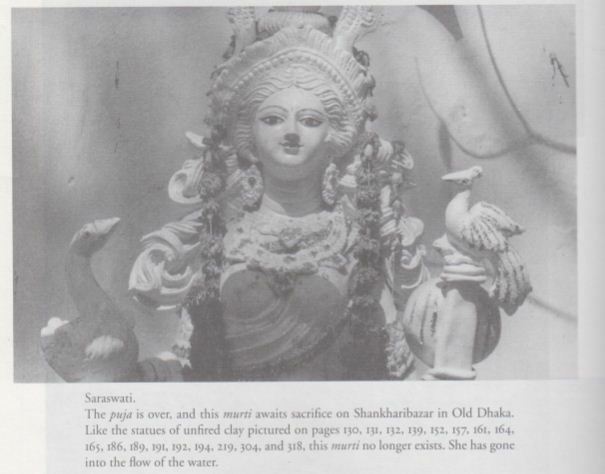 Saraswati sits, smiling, her whiteness sharp against the deep red backdrop, pulling people toward her. The boys crumble blossoms into a basket and pass it among us. We return the flowers to a brass tray that moves from hand to hand, returning to the front where the flowers are floated over the image. The flowers are our gift of welcome to her. Then the boys pass us green leaves, stitched with sticks into small containers, filled with fruit and sweet cakes, and we accept this gift from the goddess. People enter in a pure state. Those defiled—by the deaths of relatives, say—do not participate. All have fasted, so the dais first sustenance is this Prasad, food that is both sacred and delicious. Trading flowers for sweets dining with the deity, we work to the front of the crowd. There people offer silent prayers of praise and bring worldly concerns to the attention of the goddess of wisdom and learning. Parents for their children, students for themselves, make requests for educational success. Reaching the front, each of us receives from the Brahmin a black dot on the forehead. There is an ornate dot on the forehead of the goddess the chard eye that sees within, that looks beyond, and for a moment there is a oneness among us based on exchange and symbolized by the mark left by the pressure of the priest’s finger. At irregular intervals, the Brahmin or one of the boys with a microphone initiates a responsorial litany. In quick exchange, words of praise to the goddess are spoken and repeated. Responding as one, we consolidate; repeating his words, we follow our leader, joining him in the congregation of devotion. The sound rises, sustains itself rhythmically, and then fades away. People edge forward to pray to give and receive, to know unity through the silent, motionless image, and then they leave, shouldering back through the crowd, for others are arriving behind them. 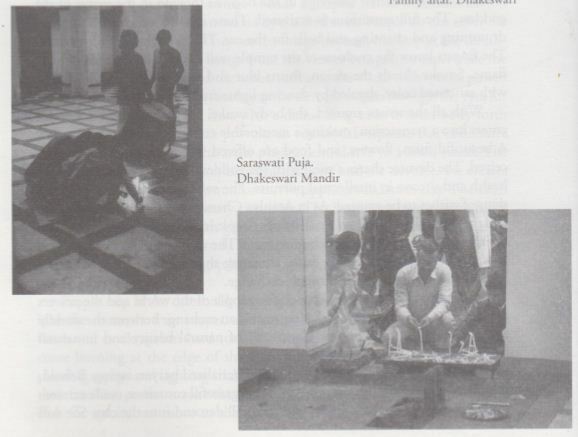 In the front, beyond the rail, a mother stands with her child until the Brahmin breaks the pattern to sit, gently hugging the child beneath Saraswati. He writes the first letters of the Bengali alphabet on a slate. He speaks softly, explaining and the child’s first lesson has passed. The mother bows gracefully before him, sweeping the air from his feet into her face. The process of the child’s formal education has begun at the feet of the goddess of wisdom. Having seen the beautiful image and worshiped the goddess it contains, men and women drift into the plaza, eating the sweets they have received. A booth offers colorful posters of the deities for sale: Durga, Saraswati, Krishna, Ganesh. Before they leave, the people drawn to the puja will visit the great temple. Its gateway gives into a square courtyard, enclosed by walls. In many temples the courtyard is left open to the sky. In others, and this is one, it is roofed in shadow, young men with big cylindrical drums fill the space with pounding sound, pulsing every motion, drawing all toward a single dance. We turn left. leave (he roofed courtyard. step through a flash of sun, and mount the porch that runs along the sanctuary. Three doors offer the dark interior to view. Within the central door there is an image of Durga. Both Ranking doors disclose the Linga of Lord Shiva. 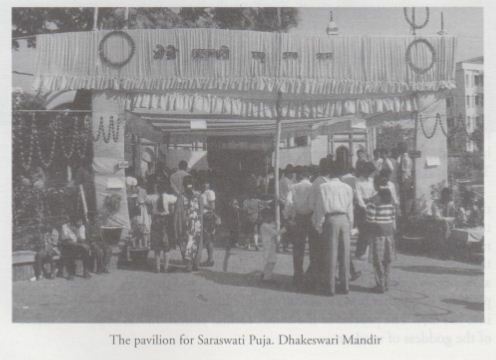 Men and women do not approach the image of Saraswati in the pavilion. 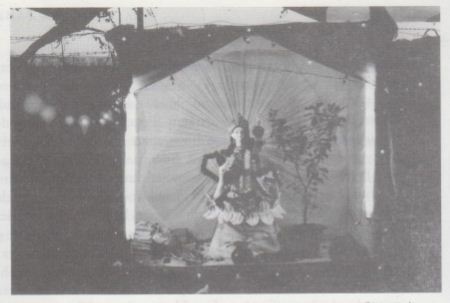 She is removed, raised on a stage within a draped frame. Communication must cross the territory commanded by the Brahmin. People do not enter the inner rooms of the temple. They see the image beyond, but stop at the thresh old. The space dividing the image from the viewer brings into experience the separation o worlds, this and the other, suffusing the visual with special power. Distance intensifies the act of seeing as the devotee strains through the eyes for contact, and it charges the icon with a demanding task: it must body forth with such presence that it can provoke an emotional response that obliterates distance. Though absent, the artist plays a central role in Hindu ritual. The artist, like the priest, mediates between the deity and the devotee. He creates an abstract and integrated form that can be apprehended from afar. The swan and musical instrument specify the deity. The large eyes in the large head, black on white, numbed with glitter, hold the gaze. Exaggerated into clarity, bold in color, the murti signals over space effecting engagement along the visual channel, closing the gap between subject and object, between the seen and unseen worlds. People stop at the threshold, peering into the darkness. They place money into the room, bow in prayer, and caress the building upon rising. Drums throb and crack against hard surfaces. Smoke flows from the candles and incense burning at the edge of the courtyard. There we pause to pray again. planting tapers and lighting sticks of S4up. Making requests for the health of their families, parents stroke the smoke into the hair of their children. Trading cash for smoke, we move to the drum, we smell like incense. Spicy aromas mingle with the sugar in the mouth, the drumming, and the clang of the bell rung when people leave the temple. It is a sunny day in a dry and pleasant season. People go and come. The drums do not stop. The sky darkens. Festoons of light swag dots of color through the night. The rails are down, space has unified. No barriers arc necessary to direct the thinning crowd. Boys pass paper bags of prasad among us. The Brahmin loads another earthenware censer and swings it to get it burning, filling the atmosphere with scent and smoke. To the beat of the drum, his arm alone dances incense or flaming lamps before the image, delighting the goddess, preserving her interest, keeping her in place so that the people milling in the smoke and the dark can continue to offer their prayers and receive her grace. The time is not made sacred by denial of the world or inversion of the norm, but by intensification of earthly experience. The senses are heightened; the aesthetic and sacred converge in the body as they do in the image of the goddess. The full sensorium is activated. There is sweetness for the tongue, drumming and chanting and bells fur the ear. The nostrils fill with incense. The fingers know the coolness of the temple wall and the heat of the candle’s flame. Smoke clouds the vision, forms blur and sharpen; the eye is pleased with saturated color, dazzled by dancing lights and flashes of glitter. With all the senses aroused, the body awake, the mind alert, the devotee enters into a transaction, making a memorable compact between the worlds. A beautiful form, flowers, and food are offered to Saraswati. Sweets are received. The devotee shares a meal with the goddess, having made requests for health and success in intellectual pursuits. The sweets consumed are palpable signs of wishes to be granted. As in Amulya Chandra Pal’s song of King Karna and the Brahmin, obligatory ritual brings people into contractual relation with divinity, momentarily visible in human form. The willing and aware host serves food to the guest, confirming faith, affirming the sacrificial cycles, entering into an alliance with power through exchange. Central to this exchange between the people of the world and the powers that rule the world is an image that represents an exchange between the worldly and otherworldly, manifesting a synthesis of natural beauty and unnatural perfection. The image is not the goddess. It is a materialized prayer, saying: Behold, this is how perfect thou art in our eyes. h is a graceful container, made extraordinarily beautiful so the goddess, pleased, will descend into the clay. She will remain so long as she receives praise and flowers and food and water and music and incense and dancing flames. At home it might be a small altar, a print of Saraswati on the wall, flowers, candles, incense, and a plate of fruit on the table before her. Or the domestic display might be grand, with a tall murti accompanied by painted vessels and heaps of books, and the proud family will welcome others to their private shrine. 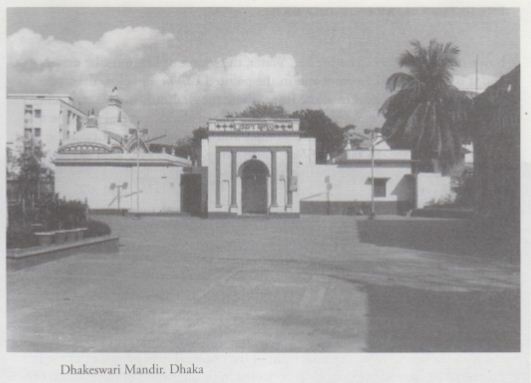 From Dhakeshwari Temple, I was led at night along black paths into homes in the neighborhood to see the goddess, Hooded by light, and receive the sweetmeats transferred by her human agents. In the home or temple, one full day is customary, but the period can be extended to two days, or three, or more. So long as the goddess is entertained in the manner of a guest, provided with fresh flowers and food, she will stay. But when the entertainment ceases, she leaves. The statue remains, but it is empty, a painted shell, and a pretty husk. The goddess enters the clay as the bird enters the cage. When the cage fails and the soul has flown, the body is but a thing to bury or bum. Knowing traditions, like that of Hispanic Catholics in New Mexico, in which the icon is sacramental, an embodiment of the holy, capable of working wonders and deserving veneration on its own. 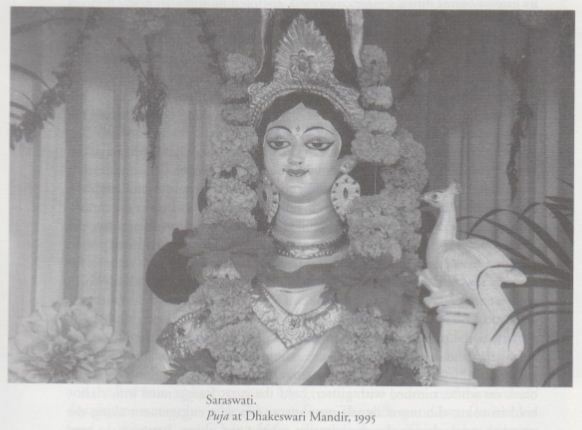 I was surprised at first by the casual treatment of old statues of Saraswati. Drawn down, held a while by the attention o her devotees, the goddess departed, leaving no tincture of power in her image. On the day after her puja, I found beautiful statues on the thronged, narrow streets of Old Dhaka, abandoned with sums from candles around them. I saw three on one corner, another standing forlornly in a vacant lot. In time, I saw others accumulating dust and losing luster in open sheds. At Dhakeshwari Temple, the old murti of Saraswati is propped in a dark corner, out of sight, in one of the temples to Shiva. There it will wait, a thing of clay and paint and glitter, for one full year. Then before the next puja, when a bright new image is installed, the old one will be sacrificed, carried to the water and, to the ululation of the women, drowned. Unfired clay will decay, sifting back into the dampness and silt, melting into the running water from which it came. The circle closes, the cycle is complete, and the rivers go on flowing. Some Indians were gone Dhakeshwari Temple by using our Hiace Micro Bus. They stayed at Bangladesh 9 days and we are happy to provide them our rent a car services throughout these 9 days.